Edit is an innovative publishing software that allows you to create, manage and promote highly scientific editorial content products. Its ease of use, process efficiency and economic sustainability position this product within the reach of editorial, academic or community groups that do not have the resources to dedicate staff to this type of activity. 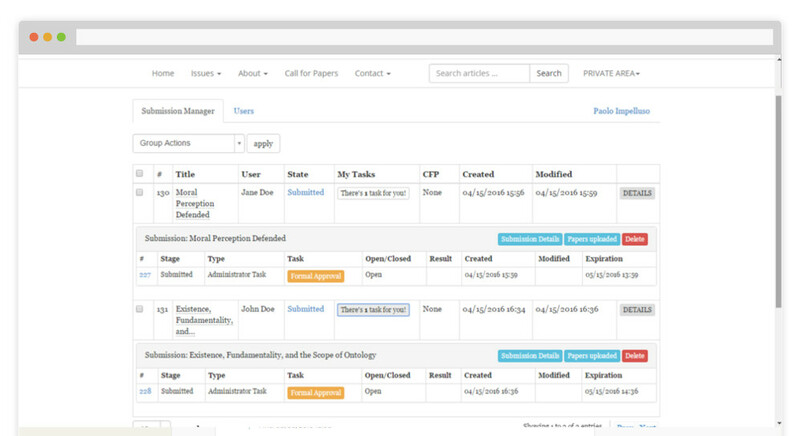 A single, simple and efficient management system that allows you to create and manage multiple publications. The management system is unique and simple, yet each product will be visible to end users through a dedicated website. Editorial board, scientific committee, authors, users: the system enables all the stakeholders involved in the creation of a publication to interact with each other in an efficient, safe and traceable manner. Would-be authors can register on the magazine’s website and upload their contributions rapidly and easily. The publication’s editorial board can then take the lead and manage the contribution all the way through to publication through the system, without any form of external communication, either within the work team, or with the author. Nowadays, access to quality systems for assessing scientific qualifications requires publications to adopt defined reference procedures. The gold standard is undoubtedly the double blind peer review. How can it be implemented? How can it be certified? Edit provides an answer to these questions through a simple, functional system. The entire procedure is handled directly within the system, according to strictly defined procedures ensuring maximum traceability and transparency throughout the workflow. Content visibility is an increasingly stringent criterion for defining the quality of a scientific journal. EDIT makes the most of this concept: interoperability with Google Scholar, Academia and online bibliographic resources (PubMed, Phil Papers, etc.) ensures that each contribution is rapidly made available to the entire scientific community, encouraging an increasing number of authors to contribute and boost the visibility and prestige of the magazine itself. Leveraging an e-commerce system, publishers can sell individual items, files, subscriptions or even take orders for on demand print. Payment procedures are quick and safe and interaction between the publisher and customers is managed directly through the magazine’s website. Are you interested in EDIT? Would you like to request a quote or a personalized demo?